The aim of proper microphone placement is to achieve a good balance between the subject sound and the ambient noise. 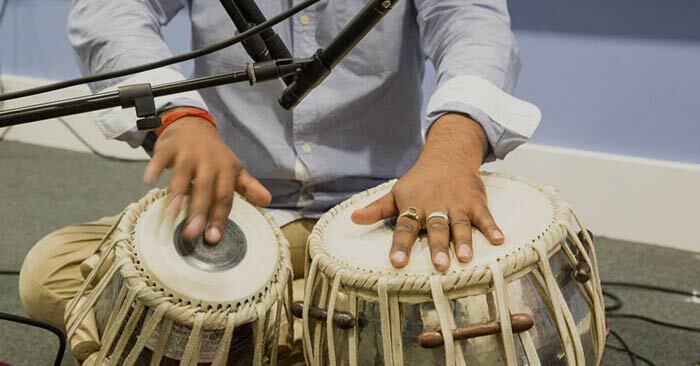 Miking the acoustic musical instruments is the biggest challenge in live shows. Experimentation with mic placement provides the ability to achieve accurate and pleasing sound reproduction on these complex sound sources. It is also an opportunity for exploring sound manipulation, giving the studio engineer many paths to the final mix. Whether you are involved in a live, music studio, a commercial studio, or a project studio, you should continue to explore different methods of achieving the desired results. The possibilities are limited only by time and curiosity. 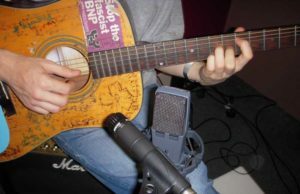 When recording an acoustic guitar, try placing one mic three to six inches away, directly in front of the sound hole. Then put another microphone, of the same type, four feet away. This will allow you to hear the instrument and an element of room ambience. Record both mics dry and flat (no effects or EQ), each to its own track. These two tracks will sound vastly different. Combining them may provide an open sound with the addition of the distant mic. Giving the effect of two completely different instruments or one in a stereo hallway may be achieved by enhancing each signal with EQ and effects unique to the sound you want to hear. 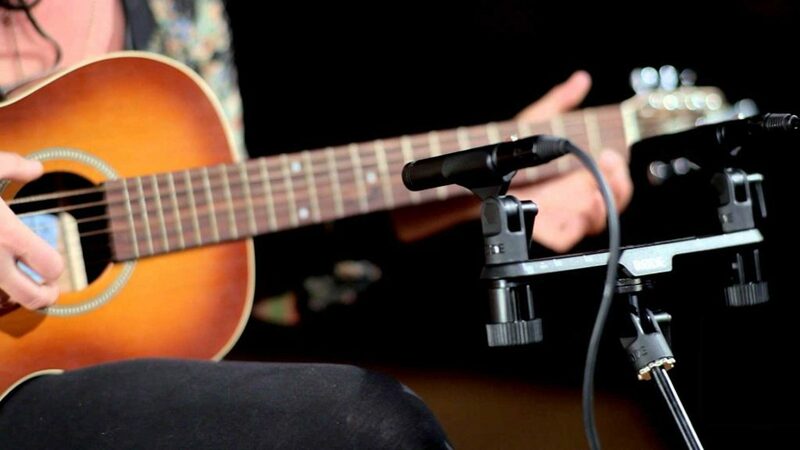 Try the previously mentioned mic technique on any acoustic instrument. Attempt to position the mic in different areas over the instruments, listening for changes in timbre. You will find different areas offer different tonal characteristics. Soon you should develop “an ear” for finding instruments’ sweet spots. In addition, the artist and style of music should blend with your experiences and knowledge to generate the desired effect. (see left image below) Bassy Good starting placement when leakage is a problem. Roll off bass for a more natural sound (more for a uni than an omni). 3 inches from sound hole Very bassy, boomy, muddy, full Very good isolation. Bass roll-off needed for a natural sound. lacks detail Reduces pick and string noise. 6 inches above the side, over the bridge, and even with the front soundboard Natural, well-balanced, slightly bright Less pickup of ambiance and leakage than 3 feet from sound hole. Miniature microphone clipped outside of sound hole Natural, well-balanced Good isolation. Allows freedom of movement. Miniature microphone clipped inside sound hole Bassy, less string noise Reduces leakage. Test positions to find each guitar’s sweet spot.